It’s going to be another hot 90 degree day. It’s time to shed the corduroys and wool. I need want some new different hot weather clothes. After no exercise for nearly 4 weeks, I’m afraid to try on last year’s summer things. I’m debating on whether I should I go to Curves or go shopping at Kohls? Logically, Kohls. There’s nothing like trying on clothes to motivate a renewed Curves workout. Now where did I put that Kohl’s scratch off 15, 20, or jackpot 30%? off coupon? 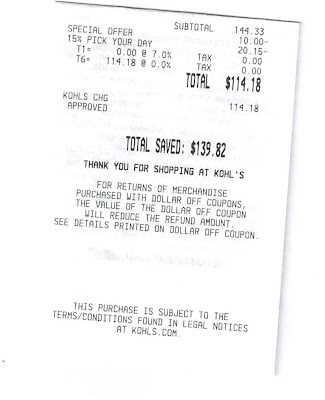 I have found that shopping at Kohls versus shopping at say a Nordstrom’s is a totally different experience. In Kohls, when I gather up an armful of clothes to try on, a sales person doesn’t offer to "start a dressing room for you?" In Kohls there is a sign on the wall which advises, "Please be considerate of other customers by limiting 5 items in the dressing room". But, no one is at the door, stopping me, counting my items or handing me a large green number. In Kohls I make my own decisions. I can, and usually do, select pants that I can button, and also make sure that there is a little wiggle room in case of “ahem”, shrinkage. In Kohls, when I get up to the register, after waiting for the ten others in front of me to complete their purchase, I am warmly greeted with “How are you today?" In Kohls, while it’s true that my pants and tops are not individually folded, wrapped in tissue paper and placed carefully in a sturdy shopping bag, they are put, hangers and all, into a roomy gigunda gray plastic bag. Where else can you shop and save more money than you spent? That’s not to say that I don’t, from time to time, enjoy the pampering and extraordinary customer service which is offered at say a Nordstrom’s, but today, it was a “leave me alone” Kohls kind of day. One thing I don’t understand, and this seems to be common in all clothing stores, is why all of them have the brightest, most unflattering florescent lighting and mirrors that surely must be manufactured by the same companies who install mirrors in fun houses. Curves for sure on Monday! Rico sporting his new summer look. I agree with you regarding customer service: I too usually prefer to be left on my own. When I need assistance, I just ask for it. 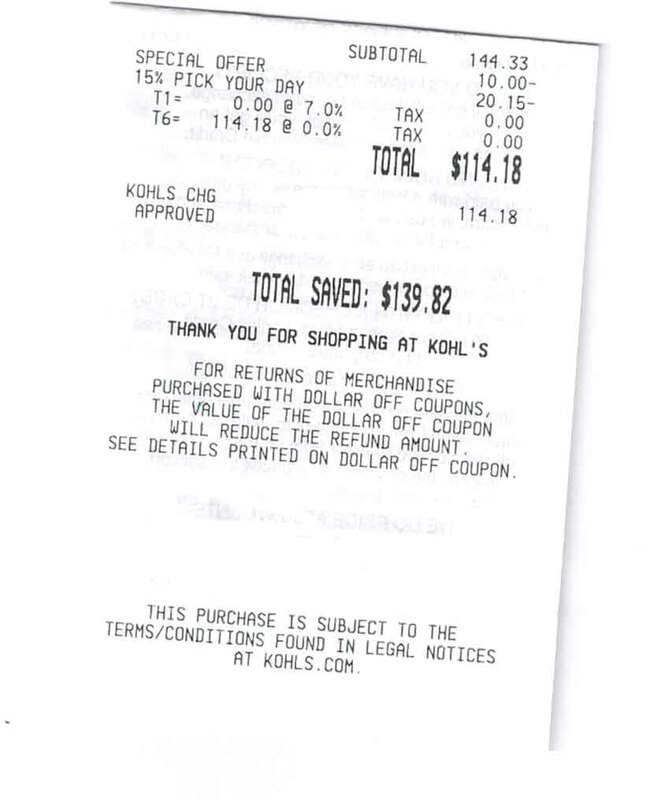 Savings at Kohl are impressive! Rico looks great; I am jealous ) pity I do not look good with a shaved head. Yes, it is good to be left on your own when shopping as long as help is available when needed. A shaved head would certainly be a lot easier to manage. I’ve had my hair pretty close cropped and I spent nearly no time at all on it. Clothes shopping - so not my favorite thing to do. I handle it the best when I go with my young adult daughter (who would never be caught dead at Kohl's but can guide me through The Gap, Anne Taylor Loft, and Banana Republic). The nearest Nordstrom's is way down in Marin County - maybe a 50 minute drive - and just too expensive b/c they seldom have sales. There is a Macy's in our nearby "big city" of Santa Rosa (about 20 minutes) -- I can do that place b/c, much as you describe Kohl's , they basically leave you alone. AND, I always have some sort of coupon to use. 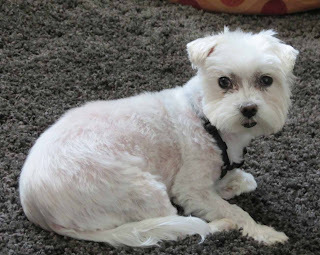 And Rico looks very comfortable and handsome! Yes, I like shopping the net. It is easy. I like that sizes, styles and choices of color are more available.